Describe your business a little bit for me. ZealousArt and painting pARTies is a mobile art pARTy business. These pARTies are great for team building, celebrations or just a girls night in. I have been doing mobile pARTies for 3 years now and love to see how people fall in love with art. I can do groups up to 30 and also have public event at local restaurants and coffee shops in the Langley Surrey areas. I service the greater Vancouver area. Women who love to have fun with their friends and try something new. I also find that I have many mother and daugther ‘date nights’ these are women in the 40s bringing their mothers! I love it! Business groups of people that enjoy to work and play together. I received an easel as a gift 5 years ago and friends were amazed at what I was able to paint with no formal art lessons. I would show them how to paint while listening to music and drinking wine. Not long after having a few ‘paint nights’ with friends, on of them asked if I would bring all the supplies to her house because she wants to have a painting pARTy for her birhtday with her closest friends and well, so it all started. One pARTy led to another and here we are today! 4. What’s an “art party”? 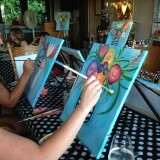 An art pARTy is 2-3 hours of informal art instruction while having fun, eating drinking and listening to music. It is basic instructions with a lot of encouragement to be creative and have fun! …and everyone can do it! No artistic skills required. 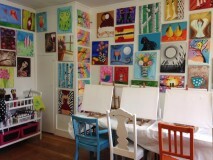 A subject is chosen for the night and I supply everything from the table coverings, aprons to the paint! By the time you get home the painting is dry. What kind of businesses or people do you get the best referrals from? Word of mouth from those who have attended a pARTy. Many walk in stating they can not even draw a straight line with a ruler and then go home with pretty decent paintings. The enjoyment of the process and the end results have them so surprised and they want all their friends to experience it too! What do you like todo in your free time? I like to paint in my free time! 😀 I also love to go out on my kayak and go for hikes with my husband and two boys. How has social media influenced your business? Many of my first time clients would mention that they have been following me for a very long time on either Instagram or Facebook and are happy to eventually book a pARTy. I am always interested to hear where they heard of the pARTies and are very excited to know that all the effort on social media is paying off. Not only is it great for new clients but I love supporting other local businesses and have met many local busienss owners through Facebook. I have partnered with a few and are offering pARTies at quite a few locations in the Langley and now in Cloverdale area. Social media plays a very big role in my business. What are you looking forward to this fall in your business? I have partnered with a local artist in Downtown Langley that has a beautiful art studio where I will be hosting pARTies on a weekly basis! The building was build in the 1920s and still very authentic. The space can also be booked for private events and I will be hosting public events. The set up is bright and beautiful. How has FVEPA helped your business? I have learned so much since joining FVEPA and the monthly networking meetings are always a blast. Not only am I building lasting relationships with potential clients, but I am referring my friends and other business owners to FVEPA members with confidence. What do want peopl e to know about art and/or artists? About art – it does not have to match the curtains. Only choose what makes you happy, if it matches the curtains… that’s a bonus! About Artists – there is an artist in you too… maybe not a paint brush, maybe your words, your voice … we all have it. If you are without opinion on art or artist attend a painting pARTy.